I recently used my homemade fajita seasoning to make steak fajitas. I have always made them with chicken. I had some steak in the freezer that I wanted to use up so I gave it a try with steak. It was really good. I will be making this version again soon. Hi Lynn, I found you through Susan. I love the beautiful pictures you post throughout your blog….even the lettuce looks extremely tasty! Blessings! Sorry, this comment is not about steak fajitas. The Shamburgers directed me to your blog for the apron give-a-way & I loved your whole blog. I recently got interested in baking bread & was working with biscuits. All the biscuits I tried were all really dry & my dad could barely get them down. So I looked on your blog for a recipe & found the Cream Biscuits. They were really great, & even moist. I was so excited. I commented here because I didn't know if you went back & read your previous comments. Thanks SO much. Thank you Rachel. I am glad to know that the biscuits turned out so well. Hi. Speaking of steak, I read that you buy 1/2 of a cow. We bought 1/4, and I am not sure what to do with some of the meat such as the steak sizzler. My husband tried to cook one and it was very tough. Any thoughts? Thanks. I am not sure what steak sizzler is. Some cuts are called different things in different parts of the country. I would internet search it and see if you can find out what anouther name for the cut is. It took me a couple of years to learn what to do with what. Several times we ate tough meat b/c I did not cook it right. I have also called the butcher that does our meat. They are usually really nice about answering questions I have about a certain cut. I hope that helps. 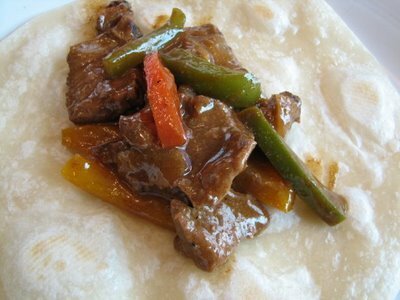 I haven’t made Steak Fajitas yet but want to and will most likely use a mix so it’s nice to know your hubby likes them!